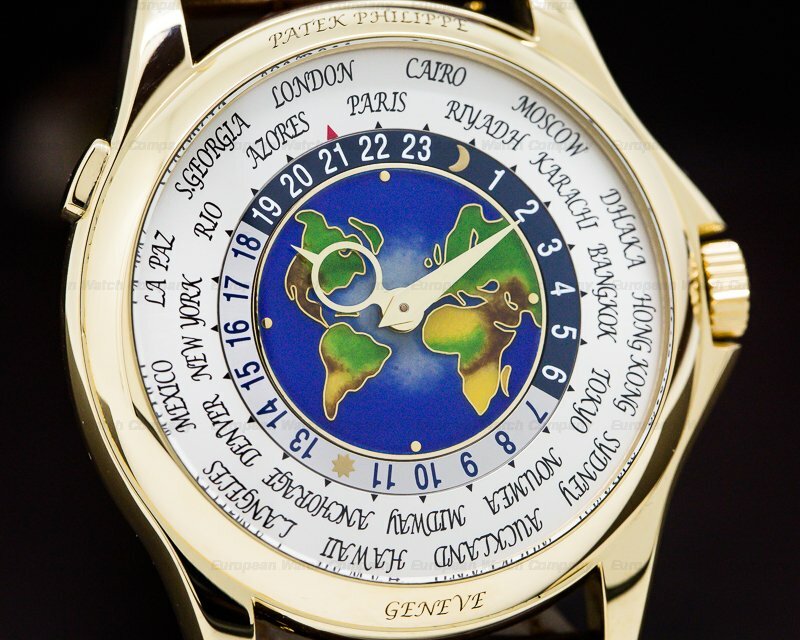 This is an 18K yellow gold Patek Philippe World Time 5131J-001. 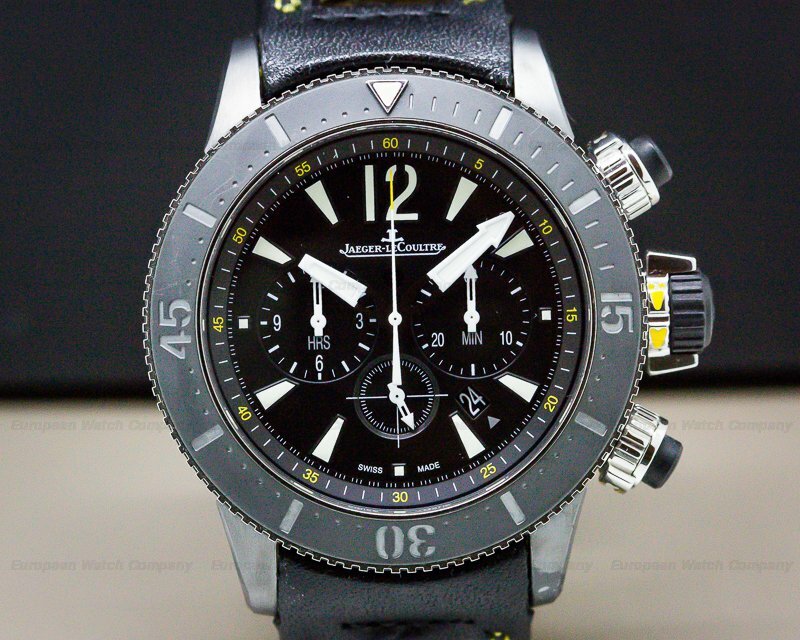 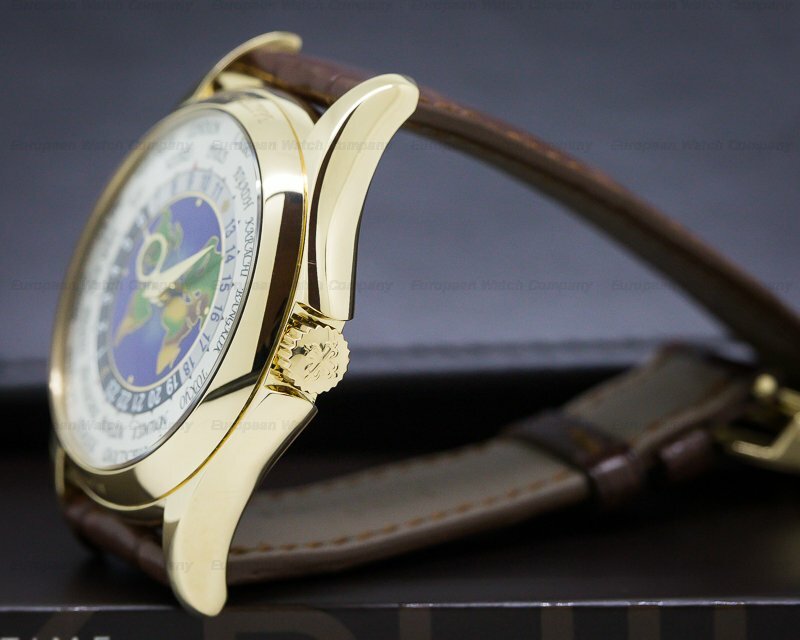 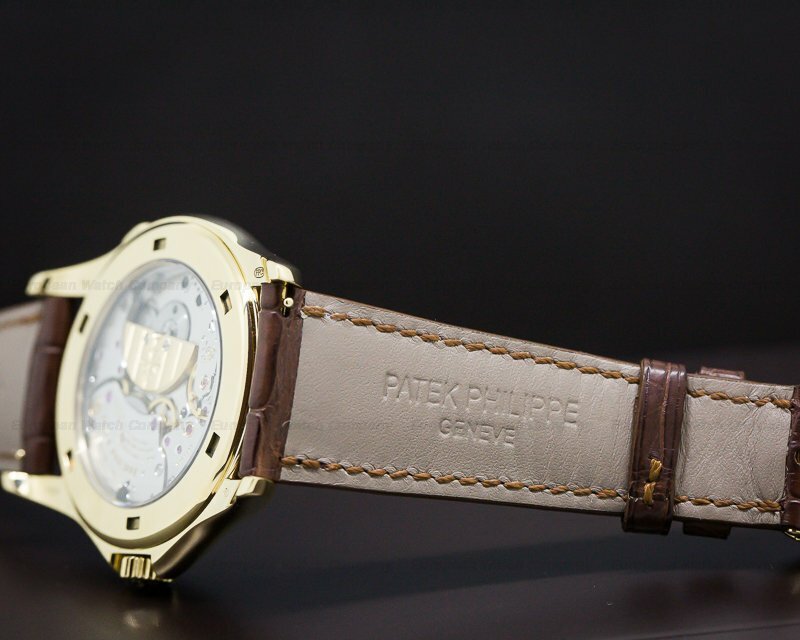 It has an alligator leather strap with an 18k yellow buckle, and a scratch resistant sapphire crystal. 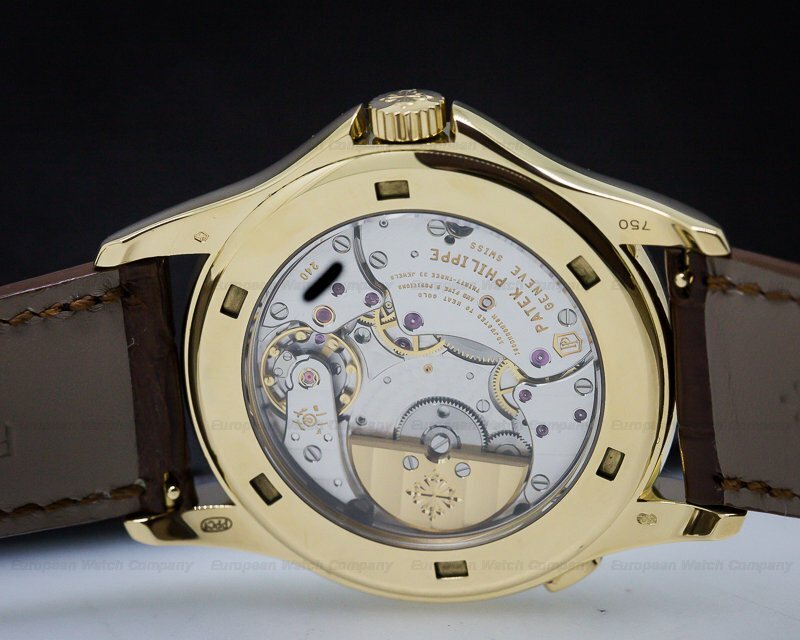 The 39.5mm diameter solid three-body case, curved lugs, and flat bezel engraved "PATEK PHILIPPE - GENEVE," are polished/brushed. 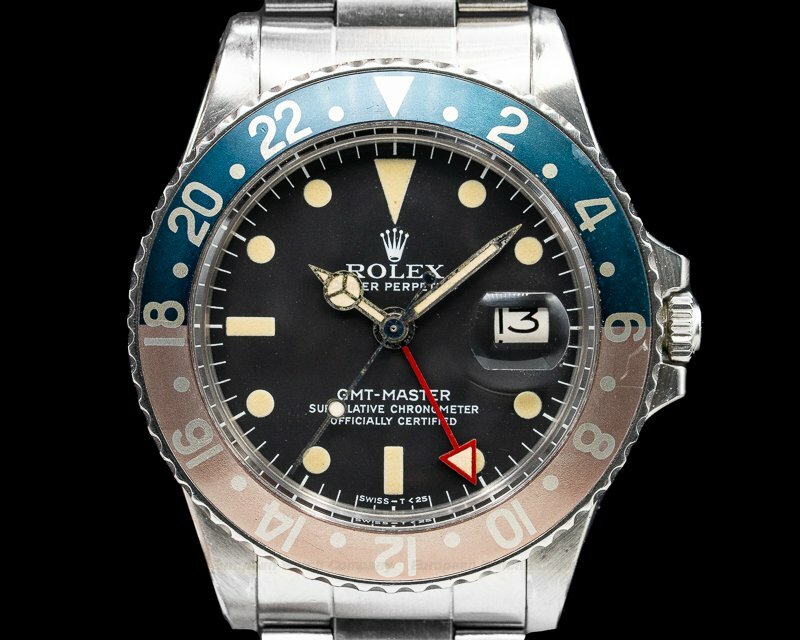 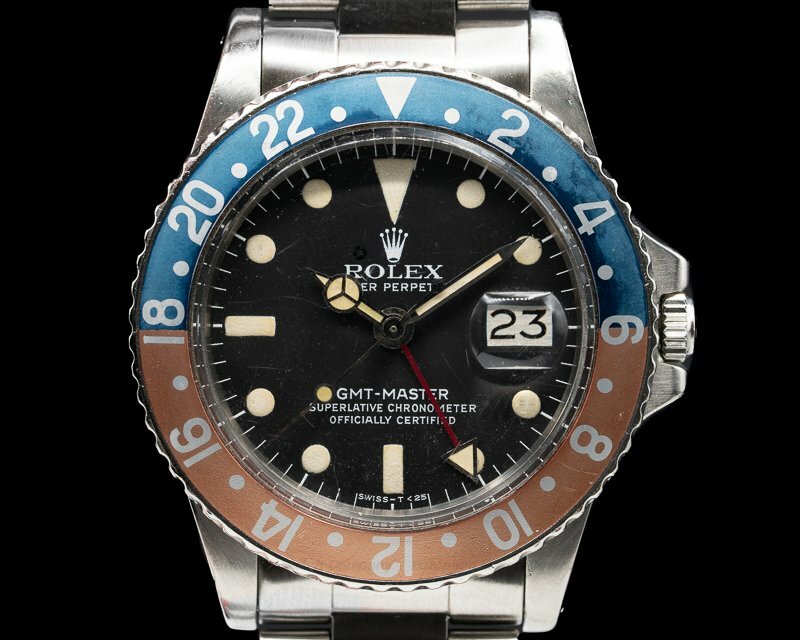 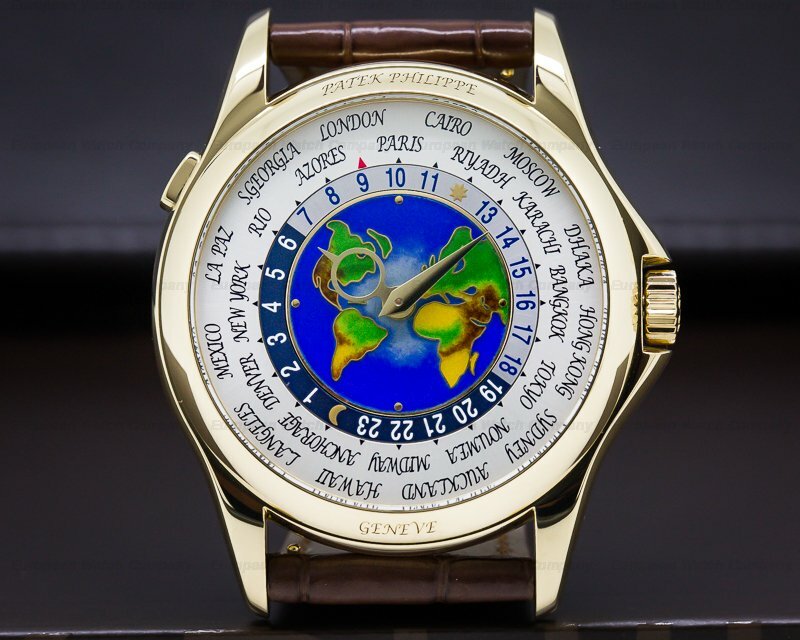 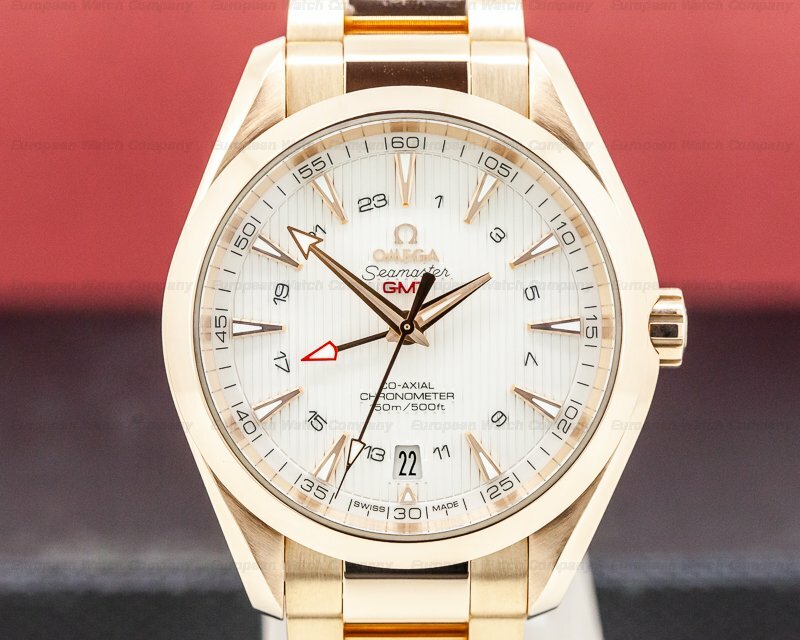 It is inspired by the original World Time watches with a full color cloisonné enamel world map, and a perimeter white reserve with 24 capital cities/time zones. 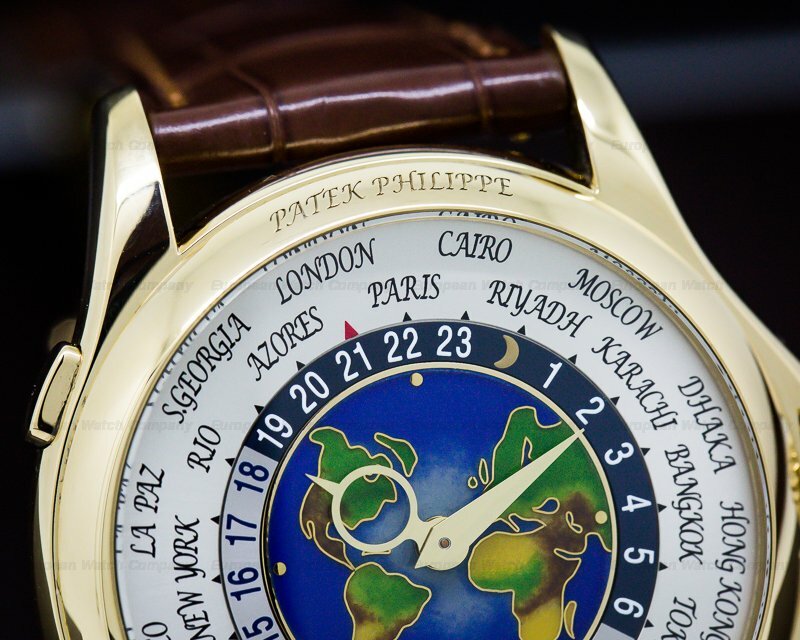 The Patek World Time system is based on Master horologist, Louis Cottier's 1930's mechanism for exhibiting time zones all over the world, including the ring-shaped hour hand. 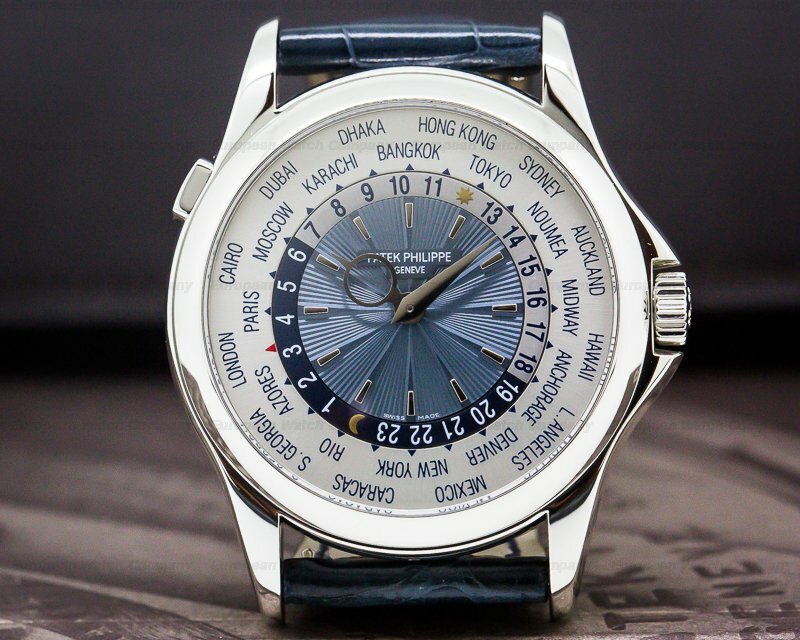 the button at the 10 o'clock position adjusts the 24-city complication by advancing the hour hand in hour increments to get the local time zone when traveling. 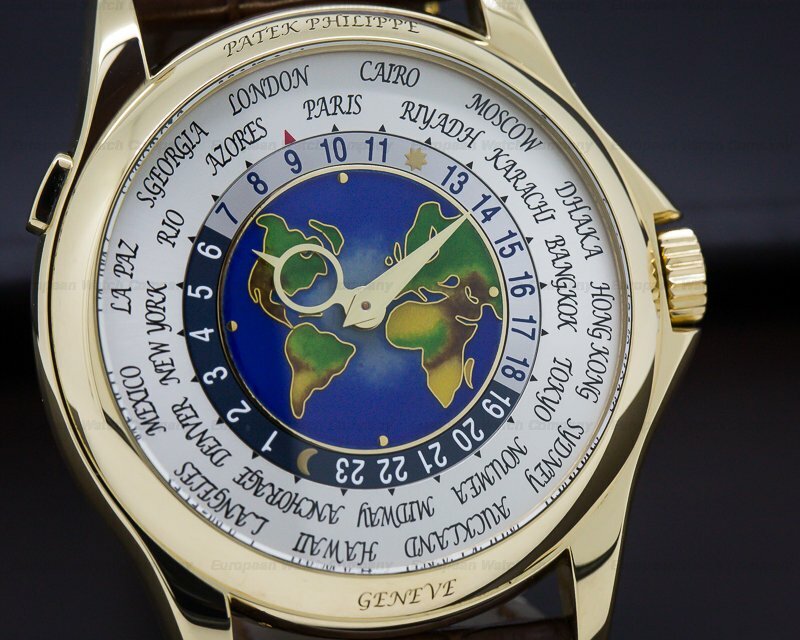 This moves the city ring so your local time zone will appear at 12 o'clock; the ring is color coded to indicate if it's day or night. 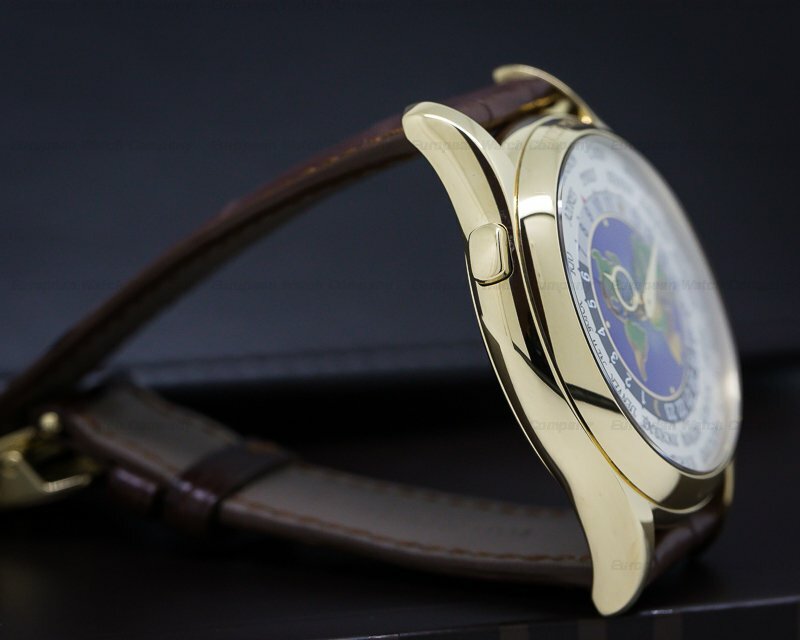 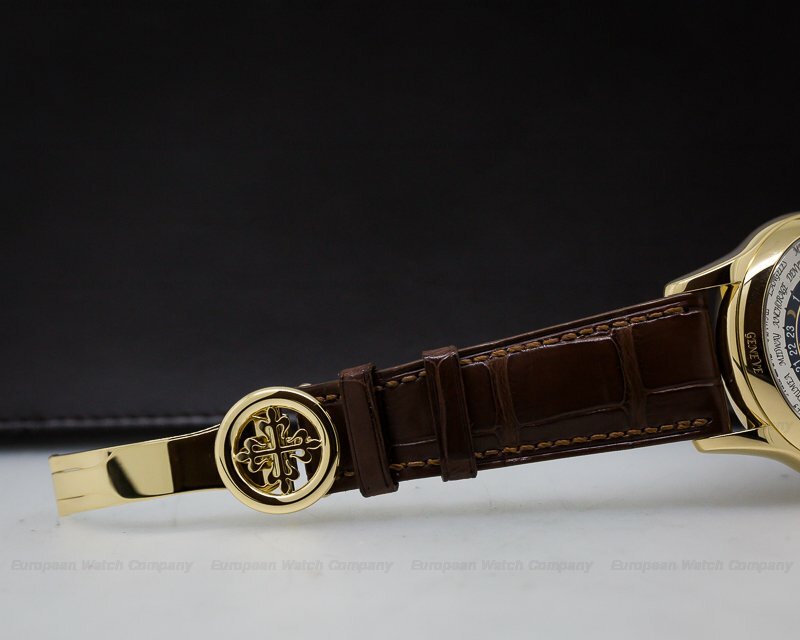 It's water resistant to 25 meters/80 feet, it has a power reserve of 45-hours at full winding, and the 10mm thick case, dial, and movement are all signed. 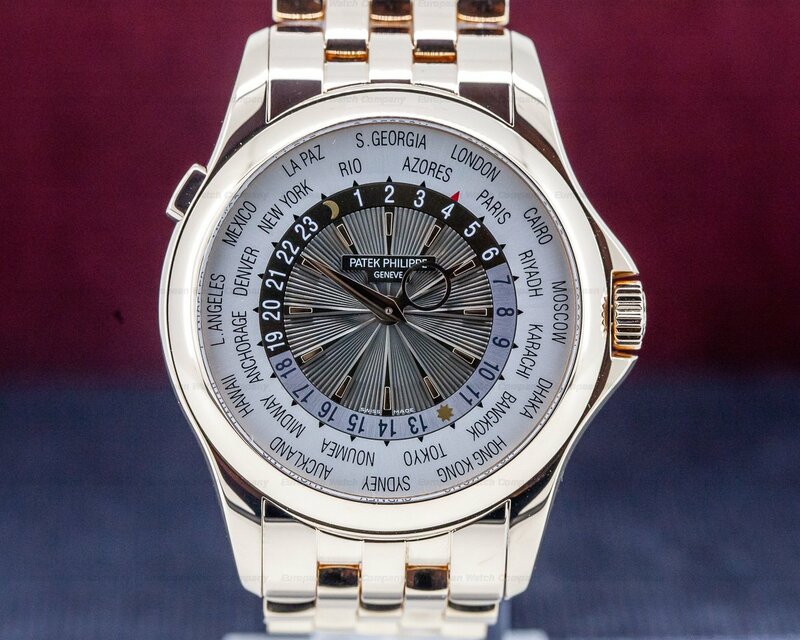 This Patek Philippe World Time 5131J-001 has a caliber 240 HU mechanical automatic self-winding movement. 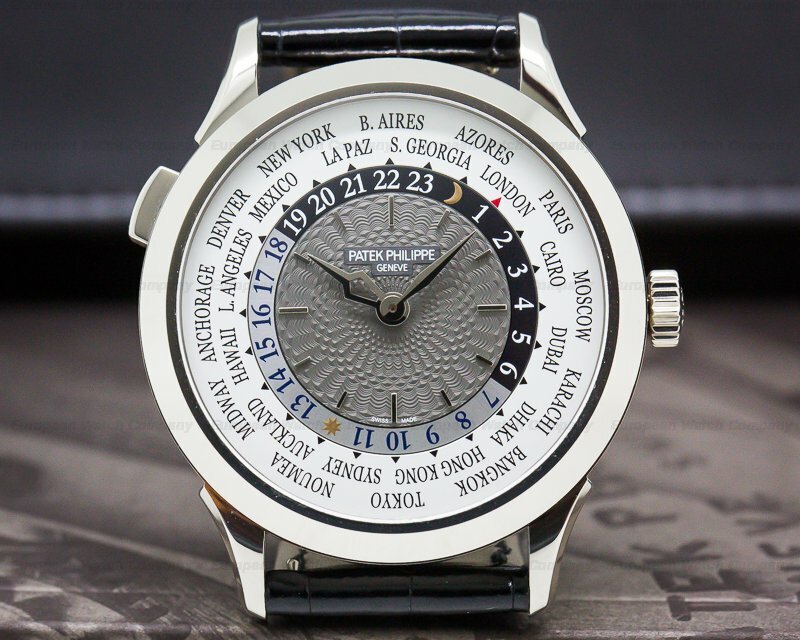 It's constructed with a monometallic Gyromax balance wheel, 33 jewels and 239 components. 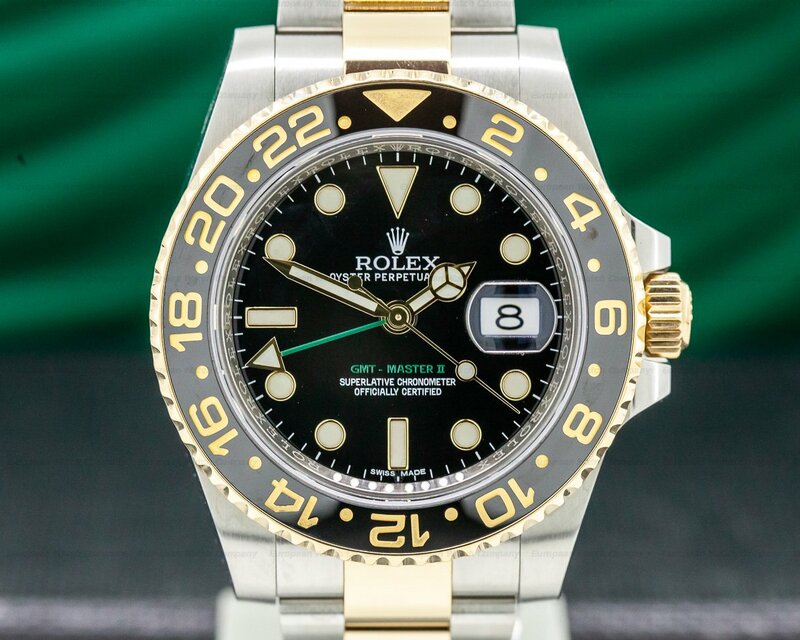 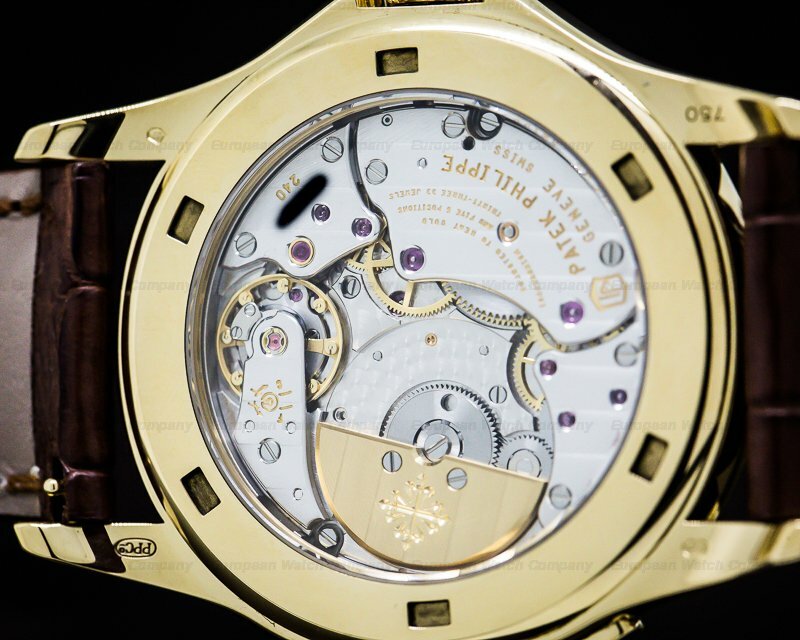 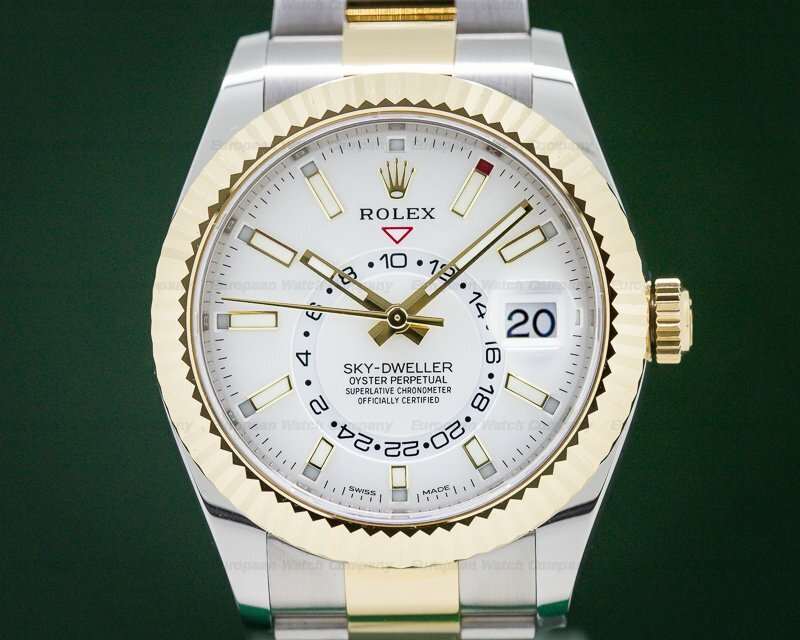 It includes a 22K gold off-center mini-rotor, and the mechanism oscillates at a frequency of 21,600 mph (3 Hz). 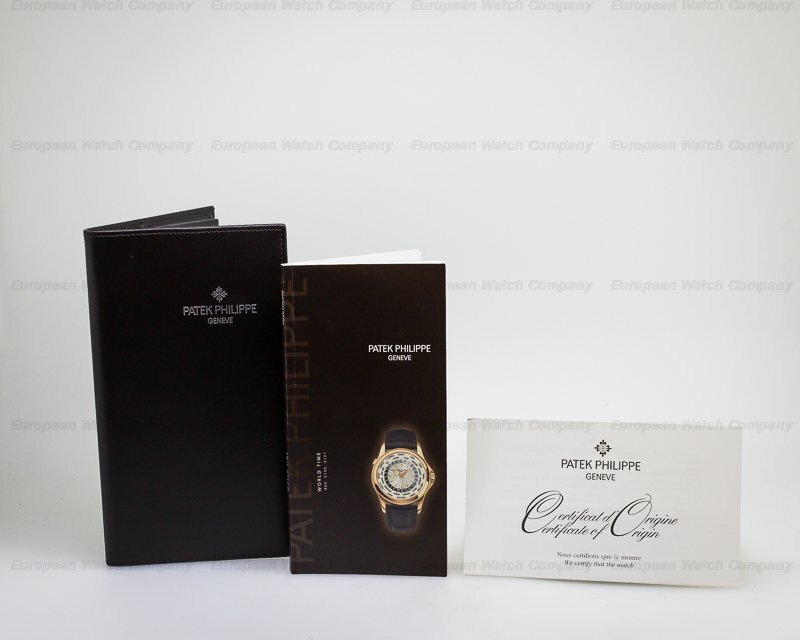 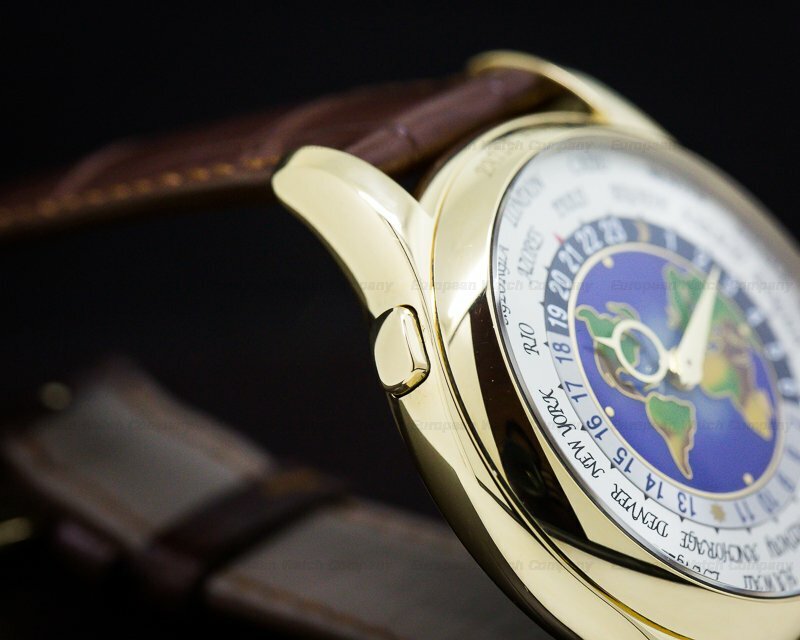 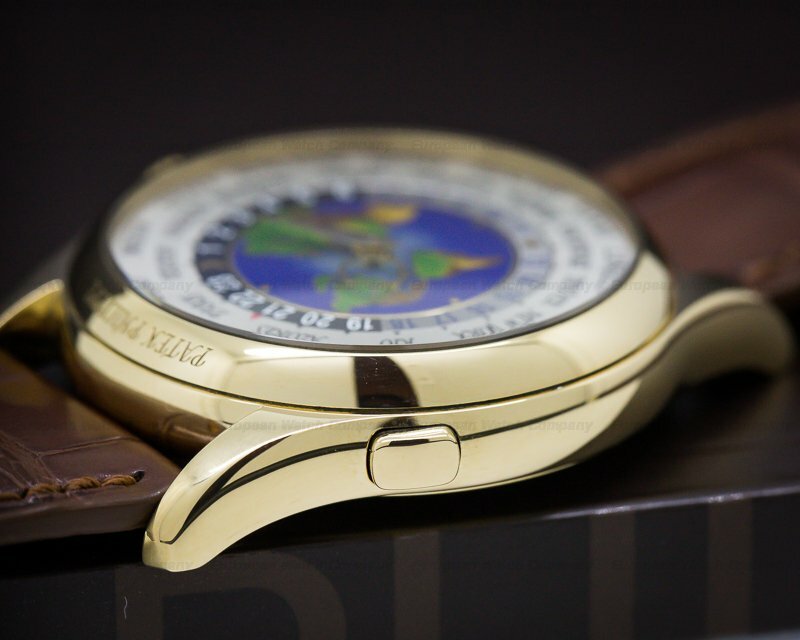 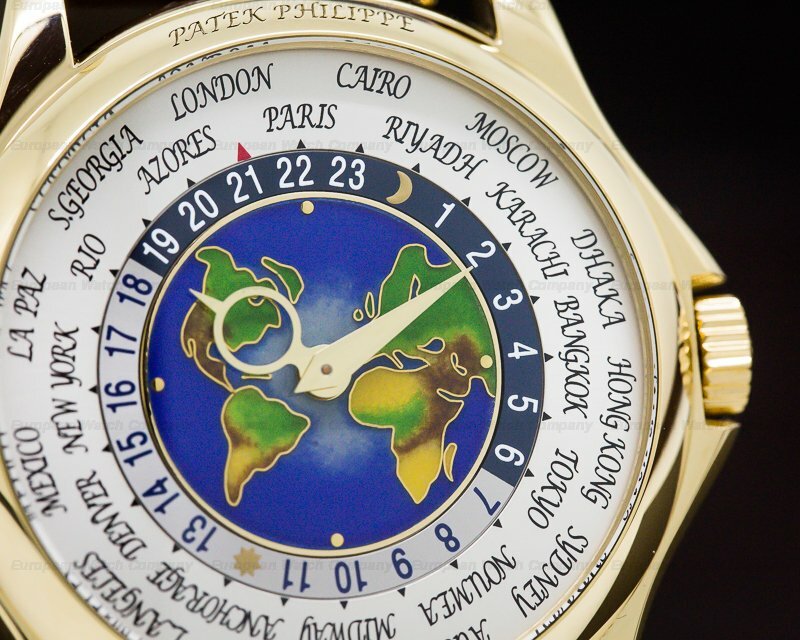 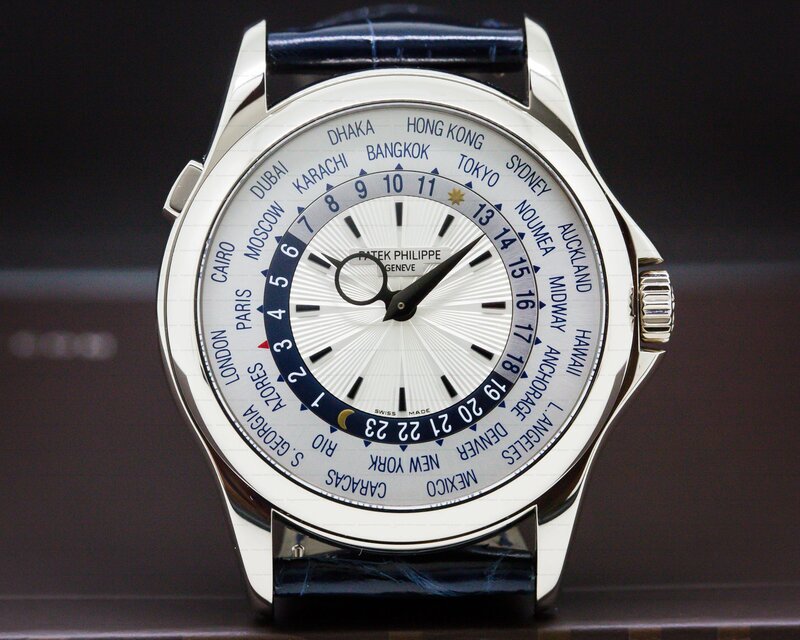 The Patek Philippe World Time 5131J-001 was introduced in 2006.